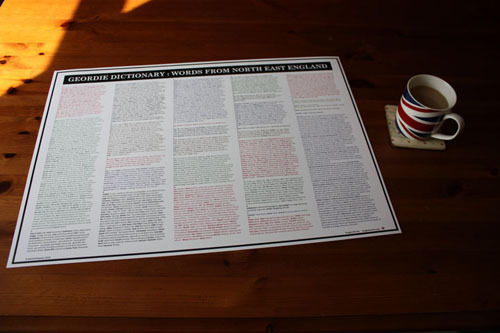 These are Geordie words beginning with I, K, K and L. The phrases in bold are translated at the end of the page. I Says, Aw says: I Said. Jaa Breaker: A long, difficult word. Jedart Laa: Jedburgh Law. A kind of rough justice once administered in the Borders. Means to hang first and then have the trial later. Jedart is a local name for the town of Jedburgh just over in Scotland. Jinny Spinner: Cranefly, also known as a Daddy-long-legs. Kale: Cabbage or a kind of broth. Keel: A boat for carrying coal to ships in the river and operated by Keelmen. Ket: Rubbish, offal or waste, see also Ket(s) below. From a Viking word for waste meat. Ket(s): Kids sweets especially in Durham probably derived from the above because they were considered bad for you. Kidda(r): A term of endearment for a young man or a brother. Knackers: Pieces of wood used by North East folk musicians like castanets. Knackered: Tired, exhausted, weshed oot. Laa: Low, law or a hill (a law). Lad(s): Bloke(s) or young men/man. Lang: Long – Anglo Saxon word. Larn: To Teach or to learn. Anglo-Saxon word. Larn yersel’ means teach yourself. Lashins: Plenty, lots usually in relation to food or drink. Lass: A woman or young girl, from a Scandinavian word laskr. Law (or Laa): A hill. Leazes: Pasture land belonging to a town. Liggies: Testicles. Also marbles (glass balls used in the game of marbles). Like: A word often placed at the end of a sentence as a kind of verbal full stop. That’s it, like. Aa knaa what yer mean, like. Linn: Waterfall in Weardale or Northumberland or the pool at the base of it. Linty: A wren or a linnet (bird). ‘He was off like a linty’ means he made a quick getaway. Lonnen: A lane or track. Lough: Lakes in Northumberland are called Loughs pronounced Loff. Ever and ever and ever (tigithor, perhaps like the folks o’ the Shiels). A cranefly, also known as a Daddy-Long-Legs, found in the town of Jarrow in the month of June. Note to naturalists: It should be pointed out that craneflies can be found in any part of the region – or the country for that matter – during the summer months. This is not a reference to a unique species of Daddy-Long-Legs found only in Jarrow in that particular month. It is merely a demonstration of how to string Geordie words together to form a phrase. So you can put away your nets and safari hats. Eating rubbish sweets (candy) has broken my teeth / jaw. Play in the heather on the hill. It’s something your pet dog might especially enjoy doing. Fido will have loads of fun frolicking on the Fell.